So this past weekend I had some fun out in the back yard. 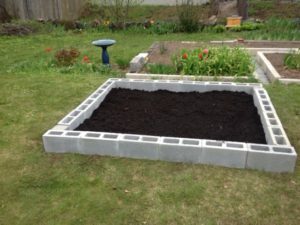 I built another raised bed in my yard to grow vegetables again. Many would think I’m nuts, but I love being outside digging in the dirt and building things. It brings me back to when I was a kid building forts and tree houses. Becoming healthier involved making a lifestyle change, which for me incorporates more outside activity than I’ve had in years past. When I was younger I was outside all the time from morning to dinner. And I was always asking if I could go outside and play after dinner during the summer. I’d forgotten how much I love being outside. I’m sharing this with you because it’s so much more than just push ups and sit-ups, running and weights. It’s everything. 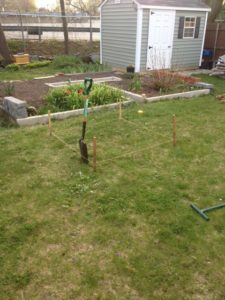 I had fun so I’m going to share some what I did through a few pictures I took of the process of building out the raised bed. First I marked out the area I was going to put the bed. 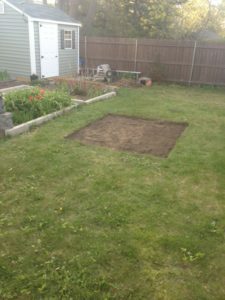 Then I removed the grass/ sod and used it in a different part of my yard to cover up some dead areas from the sand and salt damage from this past winter. Now for the hard work. You have to loosen all the dirt in the area to allow the roots of your plants to grow. 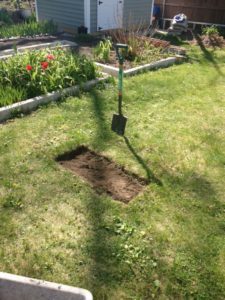 This is called “Double Digging.” You loosen this earth and then build the walls of the frame and then add more dirt on top so when you’re finished the plants will have about 2 feet of nice dirt to grow in. 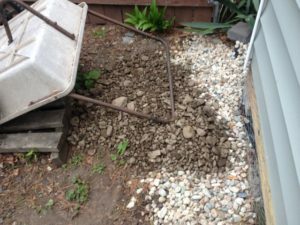 I went so far as to sift the dirt to remove a lot of rocks and the remaining grass roots. 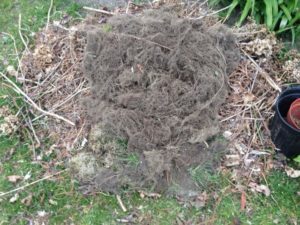 Here are all the roots I sifted out of the dirt. The birds love them for making their nests. 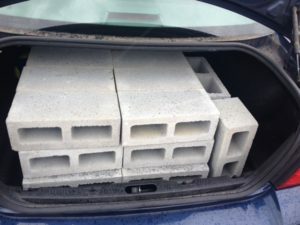 After I measured the perimeter of the bed I bought some cinder blocks (21) to form the walls of the raised bed and loaded up my trunk with them. Then I placed them around the perimeter and filled up the bed area with organic soil, peat moss and compost. 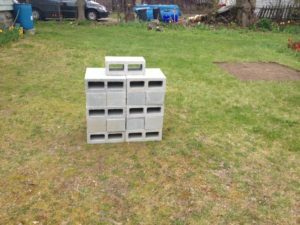 I need to buy more dirt to bring the dirt level close to the top of the cinder blocks. 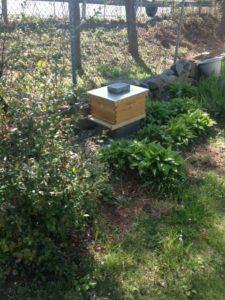 Oh, and last but not least – here is my beehive in the back part of the yard. These little critters produced 28 lbs of honey for Ann and me last year and they helped our vegetable garden in a huge way. Part of the reason I’m putting in the raised bed is to give them more habitat to play in. The population of this hive will grow from about 7,000 bees at present to about 55,000 by July. They’re so much fun to watch and they are very calm and gentle. It’s no problem at all to have them in the yard and be in the yard when they’re active. They have a very defined flight path and as long as you don’t step into it right near the hive they just zip right around you. They’re only interested in flowers. So after a lot of movement (It took a lot of work to do) I need to balance out the equation with some much needed rest.